Memphis is a city located along the Mississippi River in the southwestern corner of the U.S. state of Tennessee. With an estimated 2017 population of 652,236, it is the cultural and economic center of West Tennessee and the greater Mid-South region that includes portions of neighboring Arkansas and Mississippi. Memphis is the seat of Shelby County, the most populous county in Tennessee. 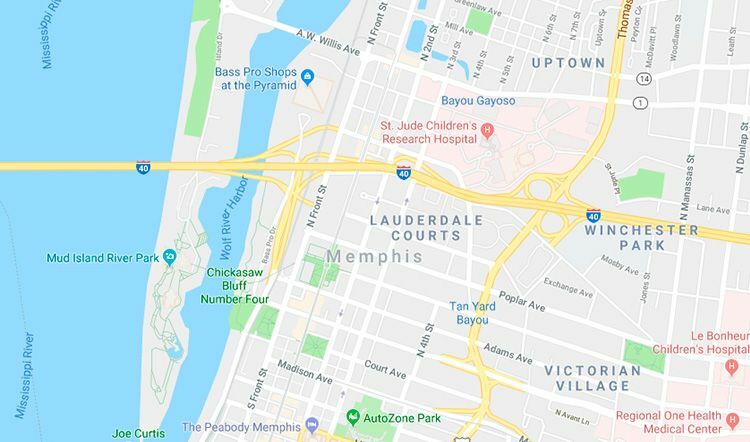 Approximately 315 square miles in area, Memphis is one of the most expansive cities in the United States and features a wide variety of landscapes and distinct neighborhoods. Memphis was founded in 1819 as a planned city by a group of wealthy Americans including John Overton and future president Andrew Jackson. The plantation economy of the Antebellum South established Memphis as a major domestic trading post for African-American slave labor and agricultural commodities, especially cotton. Memphis seceded with Tennessee in 1861 during the American Civil War but was recaptured by Union forces in 1862 and occupied for the duration of the war. Slaves escaped to Union lines here and formed camps, where they started schools before the end of the war. According to the United States Census Bureau, the city has a total area of 324.0 square miles (839.2 km²), of which 315.1 square miles (816.0 km²) is land and 9.0 square miles (23.2 km²), or 2.76%, is water. As of the 2010 United States Census, there were 652,078 people and 245,836 households in the city. The population density was 2,327.4 people per sq mi (898.6/km²). There were 271,552 housing units at an average density of 972.2 per sq mi (375.4/km²). The racial makeup of the city was 63.33% African American, 29.39% White, 1.46% Asian American, 1.57% Native American, 0.04% Pacific Islander, 1.45% from other races, and 1.04% from two or more races. Hispanic or Latino of any race were 6.49% of the population.